Since we've moved here to the new place I've been thinking about new lighting on the hall console. I'd had my previous gold tone buffet lamp for over 13 years, and once we moved here, it started to look a little "out of place". 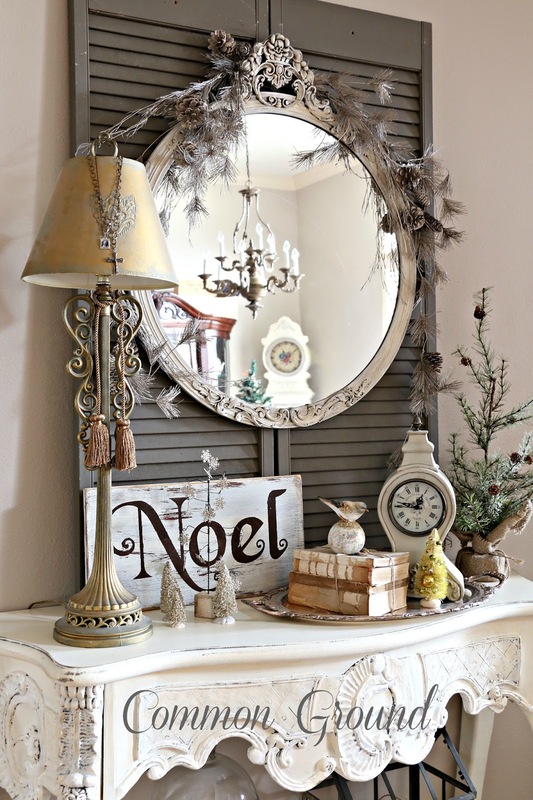 The gray shutters, white washed mirror, and silver tray were all telling me something "antique gold", was just one too many colors and textures for the space. and I wanted to pare down this space, visually. I bought two white Balustrade lamps last year and have one in the Living Room and one in my office. I really love them and knew that was the direction I wanted to head for the console. I began searching for "possibles" after the first of the year, and landed on this one, early in my search. It was just what I wanted, but too pricey for me to justify for a lamp I really didn't "need". LOVE that wonderful linen shade. by doing a search for it by name. It's "Uttermost" lighting, Arcevia Aged Ivory Buffet Lamp. Weeks went by, then I found it on clearance for almost half the price. After talking to a rep to make sure it was in good shape, I jumped on it. It feels more cohesive in the space now, and not as many finishes going on. If you find what you like, hang in there and wait; sometimes it will pay off on a returned item. It had been a "designer" return, so I was assured it was still in the original box, unopened, and it was...but at half the price. So here's the rest of the tabletop. I have my sheep print back out and the lambs are lounging. Now I'm looking for 2 more Balustrade Lamps for the Living Room. I have my eye on a couple of different options. We'll see how the search goes. Did you survive losing the hour last weekend? It has always messed me up for some reason. It feels like jet lag to me, but maybe it's just age, te he. Hope to see you Wednesday evening at 6 PM Central. Hope it's warming up where you are! Lovely lamp and lovely area. Yes, I agree, the time change always gets me a little. 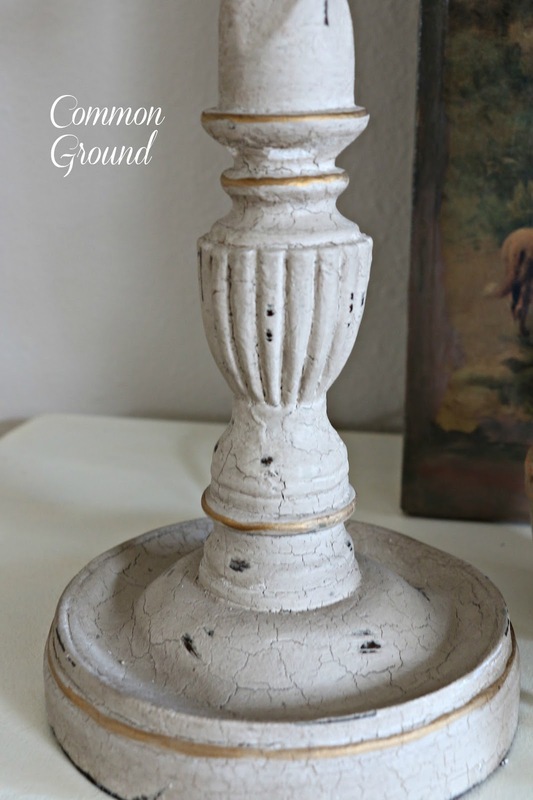 Debra it looks perfect for your entry table! I am in love with your sheep canvas. You have so many lovely pieces you've collected. I just love that lamp shade! Debra I LOVE your new lamp! thanks so much Mimi, glad you came by to visit! Your entry table looks so pretty. Love everything! I love your new lamp, Debra, and I think little lamb approves, too. I've been replacing my lampshades with linen shades. Love them! Your entry looks very welcoming with your spring touches. I'm having trouble adjusting to the time change, so we've been eating dinner an hour later than usual. So happy it's still light at 7:30 PM!! 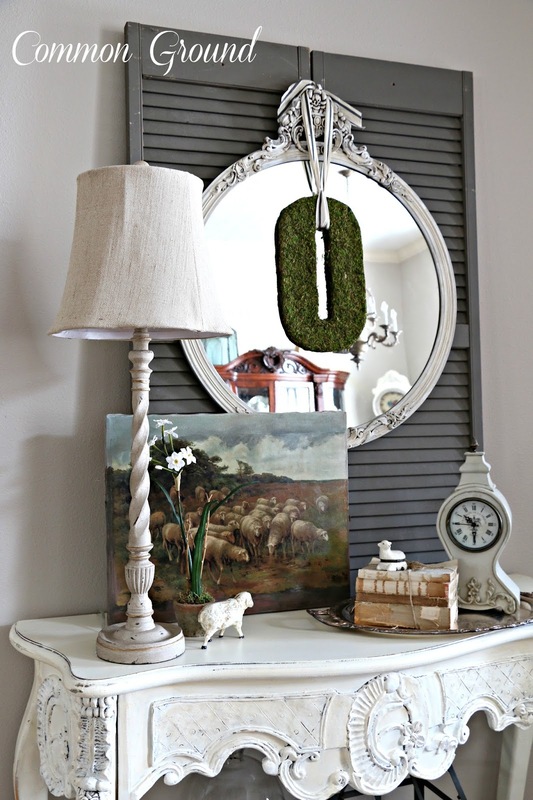 Thanks for sharing your pretty Spring entry at my party...love that lamp!! Your vignette is pretty, and springy. 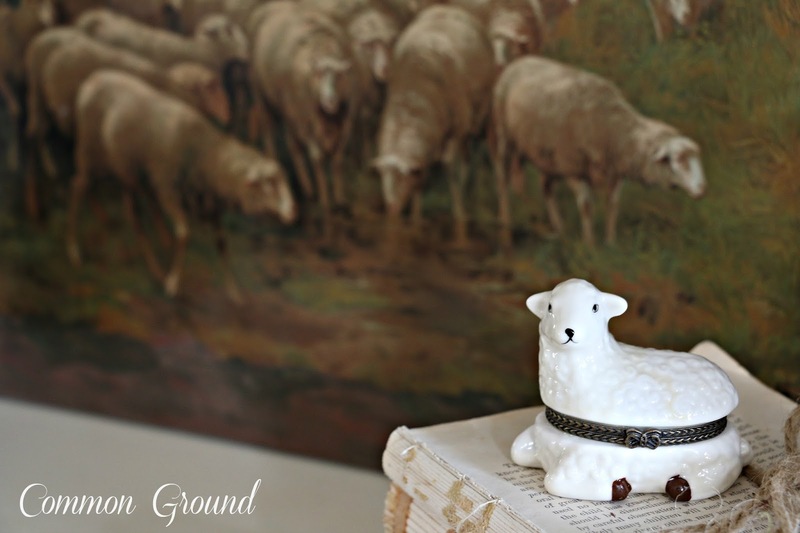 Don't be mad at me, but what I really love are your lambs, the picture and all the cute figurines. Wherever do you find them? 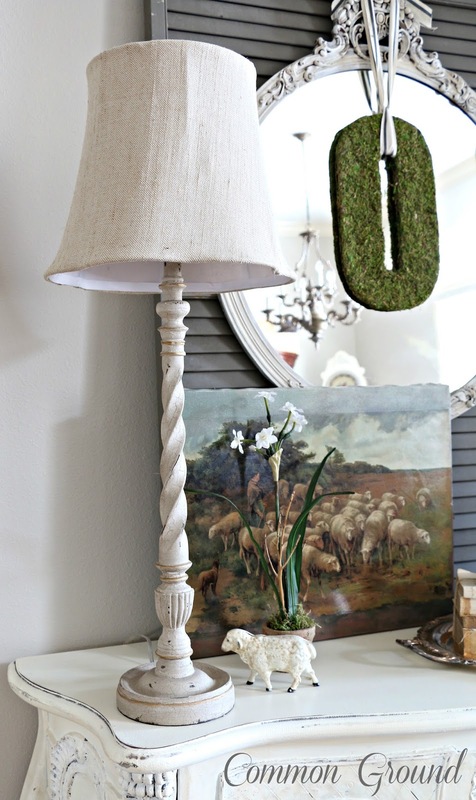 I also love the lamp, but if anything related to lambs is missing...well what can I say! I just have a soft spot for those adorable faces. I've just collected different pieces here and there. I'd love to raise sheep, maybe in another lifetime, LOL!! 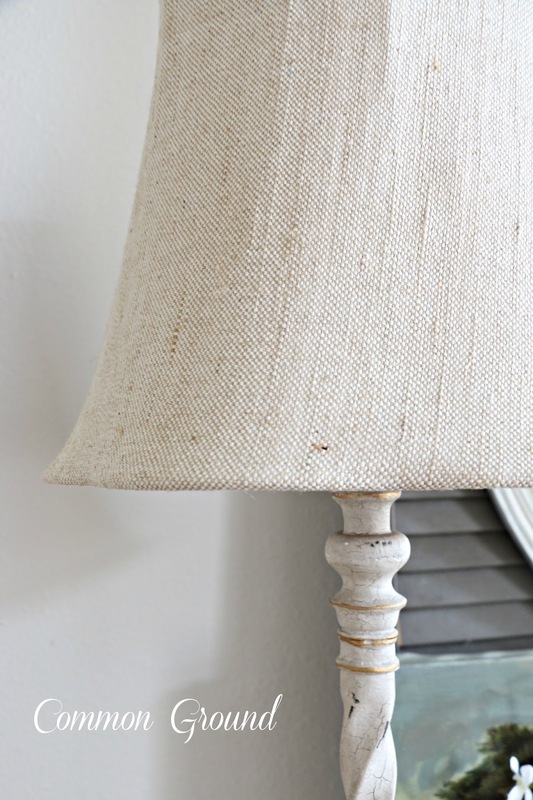 Your lamp is fabulous and I love that linen shade too. Your whole vignette is so cute and fun. Have a great week. The time change gets me every time. It feels like I lose an hour every time I look at the clock. I wish we could just do away with it. I love the new lamp. Your vignettes are always the best. Looks lovely and I adore that table. Lovely styling! You are right... if you wait long enough, you can find it for a lot less. 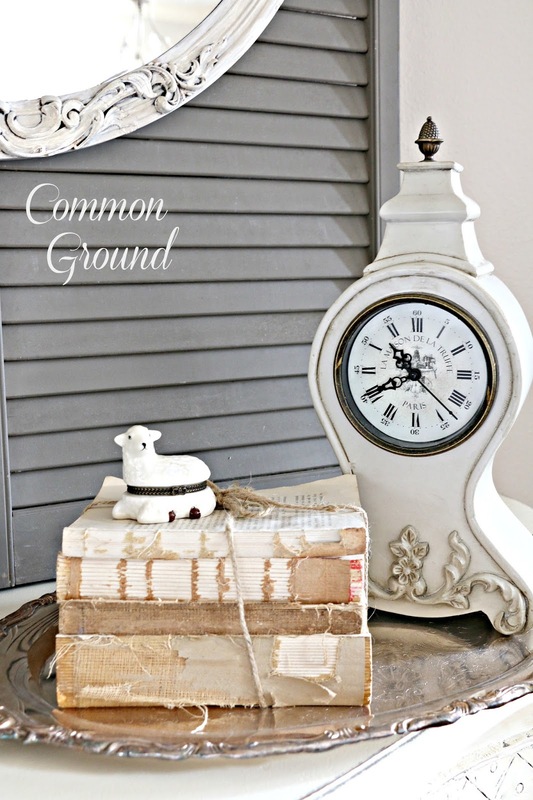 Just wanted to let you know I featured your picture frame transformation for Let's Talk Vintage this week! Thanks so much for joining the party! 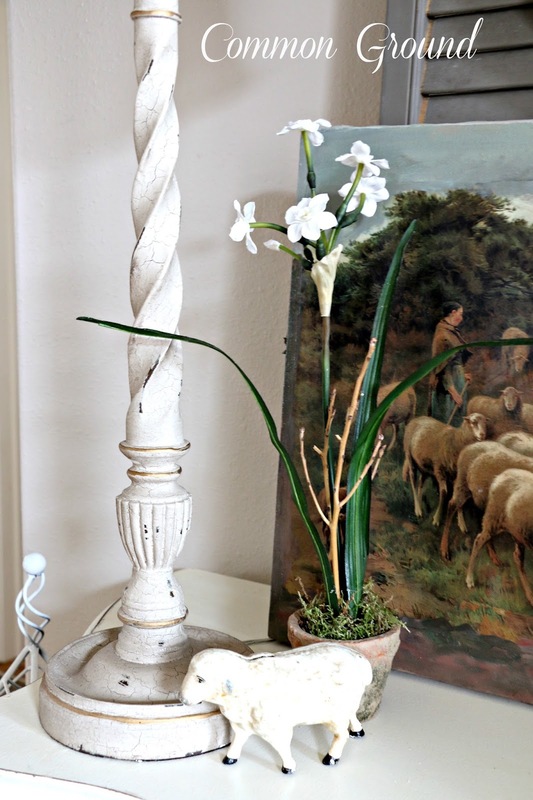 Love your vignette, Debra, and your new lamp is so pretty. I love the shape, color and the shade is perfect, too. I should really get a new lamp for our buffet in the dining area. It is not a big piece and the lamp is quite wide. I hem and haw though because I do love the lamp. I should see if I can use it anywhere else in the house. Your entry looks so pretty and welcoming...love the whole vignette! My eye went straight to your fabulous sheep print!! It all looks so beautiful Debra! 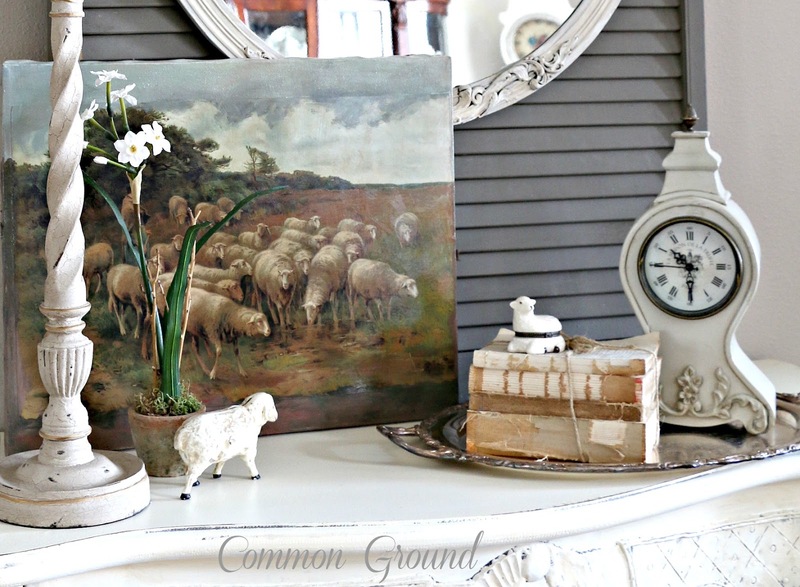 Love that sheep painting! This looks lovely! Thank you for sharing. 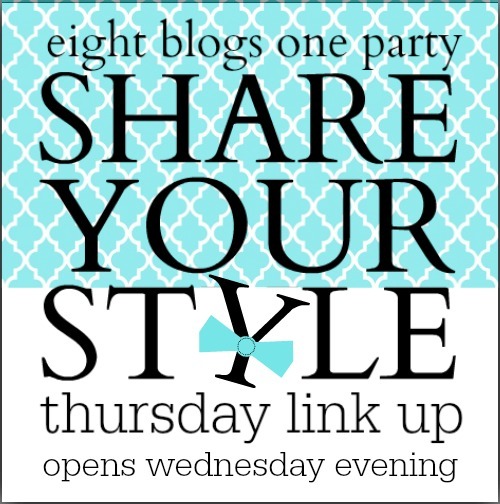 I enjoy you blog! Debra, The new lamp is wonderful and I love your sheep. Love that painting and your layers! That precious face gets me too! Your new lamp is perfect. 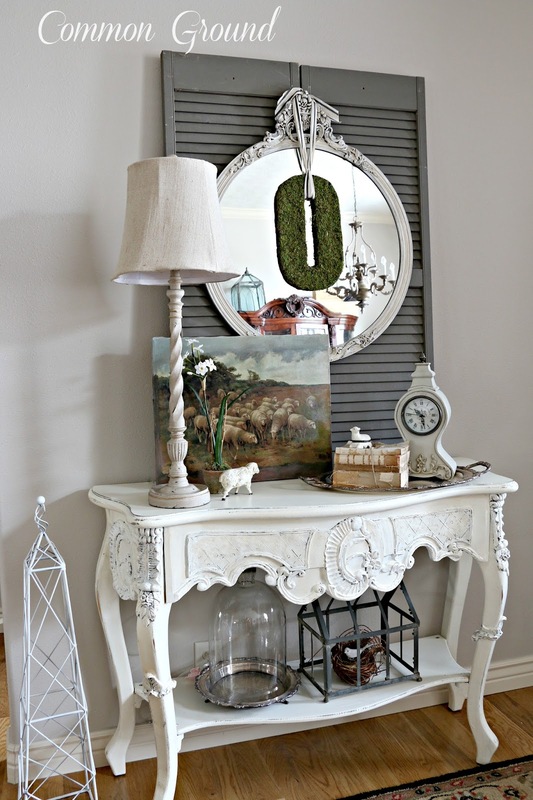 Love the lamp and so love that gorgeous table vignette with that oh so beautiful backdrop of the shutter and mirror! Such a great choice for the lamp!! Just love it, as I do everything you work your magic on!! You have styled the table so prettily! Thanks for getting back to me! You're a dear! Making some major decisions as far as the direction for my shop and blog, so I will keep you posted! you have such lovely taste. I also clutter it up, but thought your statement was a great way of saying it. "...I have a tendency toward clutter..." Loved it! I am having exactly this problem myself. New look entryway, my old gold lamp no longer works with the new scheme. I just love your new lamp, it's perfect. The linen shade is beautiful. Tendancy for clutter, I hear you!! Debra, it's perfect. I love it! I agree with waiting paying off sometimes. I had seen a lovely linen tablecloth I wanted, but wasn't willing to dish out over $100 for it. One day I walked into the shop and they had marked their last one down drastically. I could hardly believe my eyes. As my mom always told me, "patience is a virtue". lol! I'm not always that best at waiting. 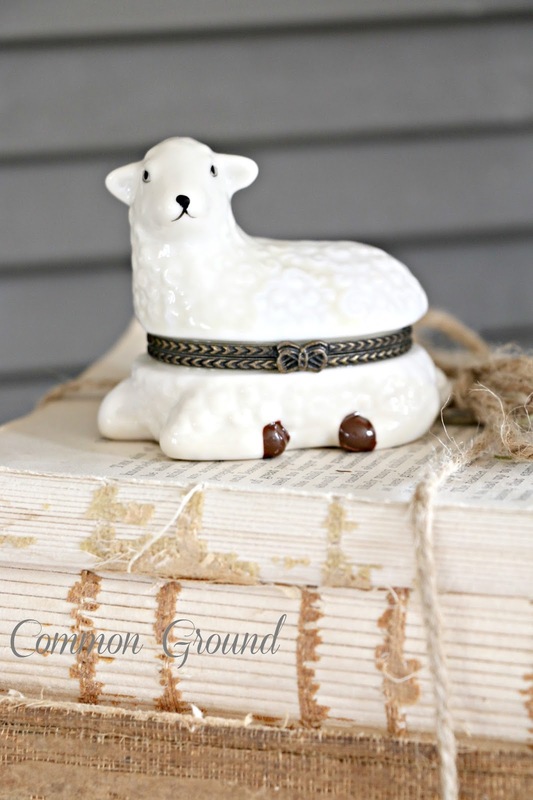 Love your lamp print and your sweet lambs! Thanks for sharing with SYC.